Sure-Grip DA45 double action trucks Complete Pkg. Generic Nylon Roller Skate 8mm Hangers - These double action hangers compatible with all Riedell and Sure-Grip double action chassis. Old School Loose Ball bearing truck. Four threaded trucks to assemble loose ball wheels and bearings on. 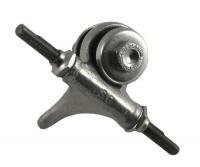 Roller skate rear stoppers, California brake pads for roller skates. Price for pad only. EXTENDED axle length 1/4" greater than normal axle - fit a variety of Sure-Grip plates with rubber pivots. Brake for front or rear assembly onto roller skates. Classic style stopper that fits on all suregrip trucks. Full assembly brake kit for roller skates. Sure-Grip double action trucks EXTENDED trucks fit a variety of Sure-Grip chassis. This price is for EACH truck. It takes four to have a complete setup! Total axle length 1/2" greater than normal axle.